Many parents have been asking me for advice about their Year 10 child/ren’s next steps on their learning journey. I need to emphasise that the vision for the Flat Bush area was for MHJC to be the feeder school for Ormiston Senior College and I remain committed to this ideal. We work hard to ensure there is a seamless transition from our contributing schools through MHJC to OSC. Diana Patience and I have regular meetings to seek ways to collaborate and we have spoken recently about how we can share resources to develop each other’s sporting programme. She has already made good progress with her school being involved in a sports exchange this year. I am also convinced that Ormiston Senior College is able to provide outstanding academic opportunities for your children. The school’s results last year indicated excellent growth and to have over half of the Year 11 cohort achieving an excellence or merit endorsement is a record most schools would envy. I attended the Prize Giving last year and was very impressed by the tone of the event and the achievements of the students. One was of particular note – Taraani Mohammed (former student of MHJC) who was awarded a scholarship from the University of Auckland to cover her entire study fees estimated at over $30k. Finally we all want students to learn in a happy, caring environment and the personalised learning programme that they are used to combined with entering the school with well-established friendships is a crucial ingredient to academic success. I hope my words, visits to the school and meeting members of staff may help you to make an informed decision. But don’t forget to listen to your child as well! How important simple gestures of affection and humanity transcend all other sporting moments. Provide opportunities for our students to challenge themselves to succeed. Encourage everyone to reflect and improve their performance. To strive for excellence but remember to be humble in victory and gracious in defeat. And always show good sportsmanship – thank the officials, supporters and other competitors, without them there would be no event! I look forward to the Paralympics which for me is an occasion which celebrates an even greater ideal of the inner spirit overcoming physical disability. Prepare to be inspired! Growing greatness – kia mana ake. I would like to urge our community to ensure that enrolment applications are handed to reception in good time. Much of our planning and in particular staffing is based on the data we collect before the end of this term so accuracy is important. The Board of Trustees has indicated that Out of Zone applications may be considered for 2017. This is in response to a number of families, particularly from Mission Heights Primary School who have found themselves to be outside the new zone created by the Ministry of Education to cater for the opening of Ormiston Junior College next year. They had originally bought homes inside our zone with the intention of attending MHJC so the board felt the need to support their application. We wish to keep families and community together – whanaungatanga. It is also important to remind the community that if you have a sibling at the college and your home used to be inside the zone your child may remain at the college and siblings are entitled to enrol without going into the ballot. Term 3 is a very busy time for us all and illustrates the numerous opportunities our students are provided to grow their greatness. My compliments to everyone who entered the Speech Finals on Friday. Ms Lambert and I had a very difficult task separating the top speeches and we were very impressed with the overall quality. Students provided original, sophisticated, informative speeches in a highly accomplished manner – congratulations. This week is an exciting one for the cast and crew of “Popstars”. Months of rehearsing will come to an end with the opening show and we are sure the students will have a great time performing to large audiences. Science Fair and Maths Week provides plenty of academic challenge to students and the winter sports continue with great performances by our basketball, netball and soccer teams. Finally an amazing bit of information was that over a quarter of our students volunteered to host the Year 6 Open Evening – what an amazing reflection of the passion our students have for their school and desire to serve. With only a few days to go before the start of term 3 I wanted to wish everyone all the best for the new term. I trust all are rested and have managed to find some Vitamin D somewhere! Our best wishes also go to the staff and students involved in the school musical “Popstars” which will be performed in week 3 (10-13 August). It promises to be an outstanding show so make sure you get your tickets as soon as they are available. The talented team has been rehearsing since the beginning of the year and I commend their commitment having given up a large part of their holidays to work on the show. At Mission Heights Junior College we use e-asTTle tests at the beginning, middle and end of the year to help us gain an insight into the numeracy and literacy abilities of our students. This data in turn helps us to personalise and cater for the diverse learning needs of our students, it is also used to help us measure student progress. 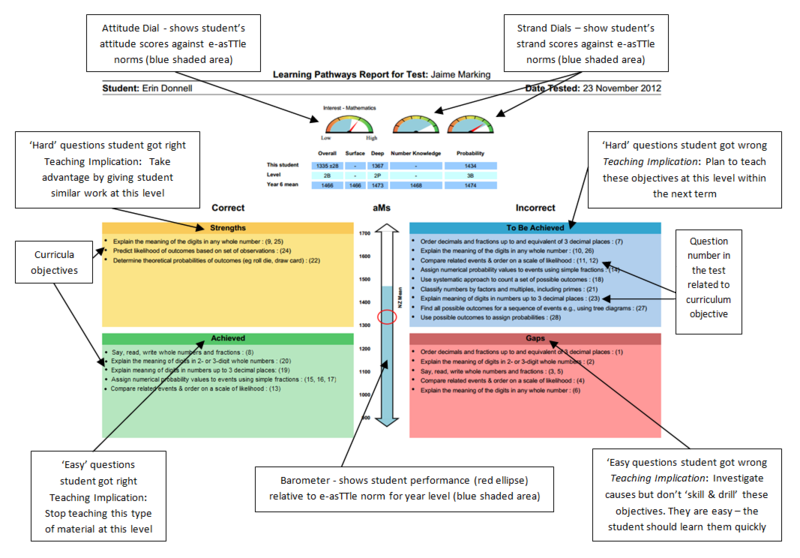 At the completion of each test each student has an ‘Individual Learning Pathway’ report that is generated for them. This report allows them and us as their teachers to identify their strengths and weaknesses. This is the report that your child will share with you in their Student Led Conference. Achieved (Yellow) – questions that, given the student’s overall e-asTTle score (in the appropriate curriculum area), should have been answered correctly and were. Strengths (Green)– questions that were expected to be answered incorrectly, given the student’s overall e-asTTle score, but were answered correctly. These questions are more difficult than his/her overall ability. However for reading, it is possible for a student to have correctly guessed the answer to questions that would normally be outside their ability range. While such responses will be excluded from the student’s level calculation, the questions will still display in the Strengths box. Gaps (Red) – questions that, given the student’s overall e-asTTle score should have been answered correctly but were incorrect. These are questions that would be expected to be relatively easy for the student. This is an area where teachers will investigate to determine the reason. It may be due to carelessness, skipping questions, illness or not having being taught it yet. As these questions are at a level easier than the student’s overall ability, it is expected that the student should be able to learn this information quickly. To Be Achieved (Blue) – questions that were expected to be answered incorrectly, given the student’s overall e-asTTle score, and were answered incorrectly. These questions signify areas that the student has yet to achieve and in which it is expected they will require more teaching and learning of strategies to achieve in this/these areas moving forward. It is possible for the same objective to be listed in multiple quadrants, because the questions relating to a single objective may be of varying curriculum levels. A question may appear more than once in the same quadrant. This is because a question may have more than one objective associated with it. More information about the ILP reports can be found here. We have recently developed and are trialling a new tool which will see students identify the area of most concern in the ‘To Be Achieved (Blue)’ box of their report and make a goal using strategies to target this area of weakness. We are hoping that by doing this students will have a better understanding of the reports, their own capabilities and take more ownership of their learning between tests by making and revisiting goals around their needs. At the completion of the test an overall score is generated for each student, from these scores we are able to identify if students are ‘well below’, ‘below’, ‘at’ or ‘above’ where they should be for their cohort nationally. This information is outlaid in the ‘MHJC Traffic Lighting’ for reading and maths and is used by teachers to personalise the learning of students with level appropriate texts and tasks. This differentiation and personalisation of learning is important in order to help students make positive shifts towards where they need to be to meet cohort expectation or to extend them and provide them with the necessary challenge needed if they are working above level. As teachers are preparing overall teacher judgments for the reporting of National Standards it struck me that parents and students may not be aware of the work of a teacher. It can best be described by what you see, which is the tip of the iceberg and a huge amount of work under the surface which is the rest of the iceberg. The tip would be what students see: delivering the lesson itself, managing the class, motivating, guiding and advising students and being actively involved in their learning inside and outside the classroom. The unseen work includes a huge amount of planning and preparation. This includes meeting with other whanau teachers to decide on the context for each year level, each term; ensuring tasks are set which cover the curriculum strands of their learning area; setting and marking an assessment task; reporting and providing feedback and feedforward on student progress and ensuring the learning outcomes are authentic and engaging for all students (differentiation). We meet once a week after school to ensure the planning is coordinated in each whanau and also track students’ progress, identify who needs support and develop appropriate action plans. Teachers, like our students are expected to be learners and so a professional learning and development programme is provided every week. This year our key target areas (Maori and Pacific Achievement; Numeracy and Literacy) all have team leaders who provide best practice, support and advice to teachers to improve their teaching capacity in these areas. In addition an e-pedagogy team leader is monitoring the chromebook trial and providing key lessons in the use of the google platform and other innovative digital teaching tools and methodology. Depending on the time of year, our teachers will also be involved in the extra-curricular programme which involves practices, rehearsals, matches and performances after hours. There are many other demands including organising excursions, attending Learning Area meetings, doing duty, completing administrative tasks like attendance, facilitating Student Led Conferences etc. This quick snapshot of the teacher’s craft may help to explain why we all look forward to our holidays! Thankfully our task is made significantly easier by the supportive MHJC community. Your support makes our job worthwhile. Our families who assist us to create a positive learning culture and students who are co-operative and courteous help us to reach our goal……. As global citizens we are affected by events internationally and I am sure you share my shock at the deaths of 49 people in an Orlando nightclub and then a British politician on the street in her electorate last week. These events remind us how fortunate we are to be living in a relatively peaceful and tolerant society. We are also reminded to continue to promote respect and tolerance as basic values within our school. The best way to combat violent extremism is to nurture the belief in our young people that differences can be resolved in a peaceful manner and that while we may not always agree with each other, we respect each other’s opinion and right to express it in a peaceful and dignified manner. It is perhaps timely to also remind everyone of the need to keep open lines of communication so that problems can be solved before they reach a crisis point. We have Learning Advisors, Senior Leaders and Guidance Counsellors to contact if students or parents need support or advice. My thanks to everyone who, as good citizens have contributed to promoting such a respectful and dignified culture at MHJC. Last week we celebrated Matariki, the Maori New Year which symbolises renewal. The school is also experiencing a new era with the election of our new Board of Trustees. We are pleased with the number of parents (11) who stood for election and signalled their desire to contribute to the governance of the school. This indicates a strong community spirit and commitment to the school. Once again we thank the out-going board for all its efforts. Under the leadership of Alanna Young and more recently Blair Telfer, the school has established a strong reputation as an innovative organisation that strives for and achieves equity and excellence. The school is also in a strong financial position and has sound policies and procedures thanks to a robust programme of self-review. In short we are well set to work with the new board to enter a new phase and a renewed commitment to the school’s vision of growing greatness – kia mana ake.